On Saturday, June 18, 2011, The Visionary Edge will present a sneak preview screening of Queen of the Sun by film director Taggart Siegel, who also directed the popular The Real Dirt on Farmer John, screened on the coast by the Visionary Edge. The evening will include a talk by Montara beekeeper Catherine (Cat) Fraley. Cat will also offer a honey tasting at the event. Bee-based products will be provided by Richard and Janet Baxter of Golden Harvest Beekeeping. Richard is president of The Beekeepers Guild of San Mateo County. The Visionary Edge will also present this event on June 25, 2011 at The NeXus in Richmond. Queen of The Sun: What Are the Bees Telling Us? is an in-depth investigation to discover the causes and solutions behind Colony Collapse Disorder; a phenomenon where honeybees vanish from their hives, never to return. Queen of The Sun follows the voices and visions of beekeepers, philosophers, and scientists from around the world, all struggling for the survival of the bees. 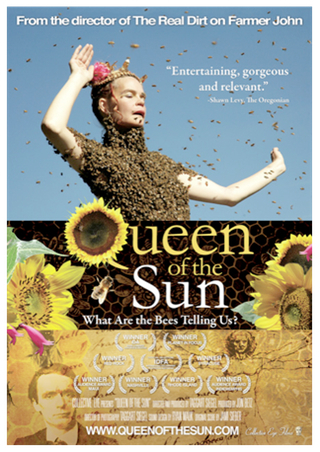 While other bee films focus exclusively on commercial beekeepers, Queen of The Sun emphasizes the biodynamic and organic communities who have differing opinions from many of the outspoken migratory commercial beekeepers and are often overlooked by the media despite their deep and profound insights into the long-term issues that have brought about the recent collapse. Queen of The Sun reveals bees as a barometer of the health of the world. Bees fly millions of miles to keep the earth in bloom and have provided humans with honey, wax and pollination for our food for over 10,000 years. Through animation and illuminated imagery, Queen of The Sun uncovers how bees were highly revered by the Egyptians, Mayans and Greeks, but the bond between humans and bees, once a sacred partnership is now a complicated, profit-driven, industrial enterprise. Queen of The Sun draws from the insights of Rudolf Steiner an Austrian scientist who, in 1923, predicted that in 80 to 100 years, bees would disappear. Steiner said: “The mechanization of beekeeping and industrialization will eventually destroy beekeeping.” Gunther Hauk, a main character in the film and a protégé of Steiner’s, against all odds, begins to build the first bee sanctuary in the world. Surrounded by industrial agriculture, he is creating a 600-acre farm to help support the bees in crisis. Through his insights, we are launched into a journey around the world to uncover the compelling perspectives concerning the complex problems bees are facing such as malnutrition, pesticides, genetically modified crops, migratory beekeeping, parasites, pathogens and lack of genetic diversity from over queen breeding. Seeking answers through unique and unusual beekeepers and scientists who have heart-felt respect for their bees we confront and address the harsh realities causing the bees to disappear. Queen of The Sun finds practical solutions and discover the deep link between bees survival and our own. Queen of The Sun is unique in its approach: while investigating the apocalyptic crisis affecting the bees, it balances the dark reality we face with both the secret wonder of the beehive and the good humor of real, devoted beekeepers. It is neither a dour, nor a dire predictor of gloom. The film weaves the ‘beauty with the beast’: landscapes and beescapes contrast chillingly with the harshness of the Monsanto-dominated global agriculture. The expertise of the scientists and philosophers is clear as they present their cases in an easy-to-digest, unfolding manner, complemented by artful animation and clear compelling imagery. The characters in Queen of The Sun share a common belief that solutions to the bee crisis lie in a renewal of agriculture and beekeeping that supports the needs of the bee and therefore supports the planet. While their solutions are simple and practical, they are not easy. Queen of The Sun demonstrates their immense efforts to rebuild a community in balance with nature. Queen of The Sun presents a compassionate inquiry into the struggle of commercial beekeepers who, when faced with skyrocketing demand and staggering losses, do their best with the methods they were taught, often unaware that their standard practices are seriously flawed. For example, artificially bred bees are malnourished on a diet of high-fructose corn-syrup, are confined in plastic hives and are transported thousands of miles, bombarded by exhaust fumes, only to be over-worked in crops soaked in pesticides. A stunning revelation- that to manufacture a single non-organic cotton tee shirt, one third of a pound of pesticide is used- underscores the sheer volume of toxic chemicals commonly being applied to crops. Because of these conditions, the exhausted and weakened pollinators become easy prey for mites, climate change, environmental radiation, viruses, air and water pollution, and the challenging effects of genetically modified crops. Media amplifies alarm about the worldwide collapse of bee colonies and scientists hunt for a silver bullet cure. In the meantime, bee advocates strive to renew a culture that takes its cues from the hive. They have wisely recognized that the bees, themselves, are our guides and they have looked to the bees’ example of collaboration and community as the model for their own actions. Einstein was right: it is impossible to change any problem by using the same tools that created it. With that in mind, Queen of The Sun highlights non-traditional approaches that do much to create positive global change. The world is at an opportune moment to see the film. The current possibility for positive change and the universal commitment to saving our planet’s future are linked. Queen of The Sun mirrors the hopefulness of this time of volatile transformation and reassessment. The optimistic response of those who saw The Real Dirt on Farmer John leads us to believe that people are ready to confront the decline of the honeybee population and its dire consequences and to embrace the changes illuminated in the film. It is the positive and hope-laden message of Queen of The Sun that opens its viewers’ minds to the real possibility of a sustainable, healthy and verdant future. Queen of the Sun is presented by The Visionary Edge. Sponsors include The UPS Store, Arrowhead Framing, and San Mateo Coast Properties. Babysitting will be provided for the film with a 24 hour advance reservation. Call 650-207-3440. Doors open at 7:00pm, film at 7:30pm, Saturday June 18, 2011 at the Ted Adcock Community Center, 535 Kelly Avenue, Half Moon Bay. Suggested donation is $12 advance, $16 door. No one turned away for lack of funds. Call 650-207-3440 or go to VisionaryEdge.org for information and tickets. Located in Half Moon Bay, The Visionary Edge produces events to inform, inspire, and empower us all to create a wiser, sustainable and more compassionate world.